Litter training isn't exclusively for cats, and with patience and perseverance it is possible to train different small pets to use litter boxes. Rabbits, guinea pigs, ferrets, rats and other small animals can all be successfully litter trained if the right steps are taken to encourage their training. Cat litters are not generally suitable for use with other small pets. Chemicals in the cat litter can be toxic to other pets, which often chew on parts of their litter. Litters with a great deal of dust can also be dangerous for small pets to inhale. Instead, choose the best litter type for your specific animal and pet's preferences. Ideally, the litter should feel natural and comfortable to the animal. 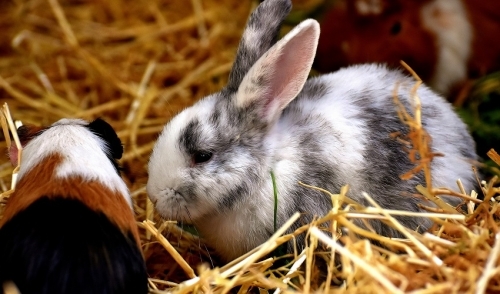 Hay litters, including alfalfa and oat hays, are popular options, especially for rabbits. Pressed wood pellets, peat moss or even shredded paper can also be suitable. Choose a litter box that is the appropriate size for your pet, bearing in mind that some animals like to stretch out in the litter box. Adding a few layers of newspaper to the bottom of the box can help absorb urine to keep the litter from getting soaked too quickly. Position the box in the corner or area of the cage where your pet has already shown a bathroom preference. Start training your pet to use a litter box right away. While younger animals have poor memories and shorter attention spans so they may not be able to learn as quickly as adults, there is no wrong time to get them with litter training. It is never too early or too late! Place multiple litter boxes in convenient locations. This will give your pet more options if they are choosy about their bathroom spaces, and it will help small animals find the right space if they are playing out of their cage. Each box should be consistent in size and litter, however, so it is easily recognized as a bathroom space. Clean the litter box frequently. This includes removing and replacing the old litter as well as wiping out the box to reduce stains and odors. Once a week the box should be disinfected by rinsing it with white vinegar, but avoid using heavily scented soaps to clean the box. These can mask the animal's natural scent, which they need as a clue for where to do their business. Watch your pet constantly when they are out of their cage for play, exercise, handling or socializing. As soon as they start to show signs of looking for a bathroom space, guide them to the litterbox. This will help them remember the approved space to use and will reinforce the training. Training your small pet to use a litter box will take time and they may never learn to use it perfectly, but if they are familiar with the box and use it well, it can make keeping their cage clean much easier.